These are probably the most amazing videos on Youtube. At least, I think so. Thinking on the topics in these videos makes me feel warm and fuzzy inside. All distinctions between myself and all other life disappear. A small confined world of conflict and struggle gives way to an unbound infinite universe. Just watch as David Attenborough walks through a field of butterflies. Just look at his face. That’s exactly how I feel when I walk through a state park, or look at the stars in an observatory, or crunch away at the mathematical equations of Physics, wondering what light does as it bounces around the room. There’s an infinite universe both on the microscopic and macroscopic scales, each unique, yet at the same time governed by the same simplistic laws. And the more Physics you study the simpler the laws become. They’re not always easy to apply to complex situations, but the laws themselves are simple and rooted in at most a few basic concepts. The simplicity of the laws is elegant, yet the sheer amount of phenomenon that can be explained using such simple principles is absolutely breathtaking. My favorite part about this next video is when Feynman talks about the light bouncing around the room. “It’s all REALLY there, REALLY REAALLLYYY there. But you got to stop and think about it to really get the pleasure.” I also like it when he says, “I think nature’s imagination is so much greater than man’s that she’s never going to let us relax.” Every line in these videos is amazing. The same applies to a computer. You can say a computer is a hunk of metal and silicon, and that would be true, but it wouldn’t capture the entire dynamic of what a computer really is. It’s how skillfully each component of the metal and silicon work together. The same is true of our bodies, and all life on planet Earth. There’s a lot of truths in the world which are true but yet don’t capture the whole picture in its entirety. I think truths like that are dangerous. They’re misleading. Whenever the new truths you’re learning empower you, connect you to everything around you, and lead to a sort of all-connected diversity, you’re heading in the right direction. Also, once you’re able to create and control, the world of scarcity and struggle for resources goes away. Two things which I find incredibly cruel in this world is our monetary system, as well as the Darwinian struggle for life. Both are rooted in scarce resources. The real truths that we need eliminate this scarcity and remove the need to fight one another. These videos feature the best and brightest of humanity. Scientists who have spent their lives studying the laws of nature, and life. Compare this to what you see on your television. On the news. All the name calling. All the fighting and bickering. This group pitted off against that group. Compare the “We’re all connected” message to that delivered by Hitler in this speech. Can you see the difference? He doesn’t see the world as a “we”, it’s only “them”. Their party must overcome all other parties. Their people must subdue all other peoples. All those who are not racially pure must be removed. All diversity of opinion must be eliminated. They must all unite under his leadership. They must uncompromisingly be the one and only power in all of Germany and the world. It’s not a world of equality and respect of diversity. They don’t see any connection between themselves and others in the world. They’re not all connected. They must continue to struggle and fight for supremacy against any and all odds, no matter the cost of life. Their party is infallible. Their fuhrer, a god. Their leaders a holy order. Their blood, pure. All upstanding Germans must be National Socialists. It’s sad that people give themselves away to these sorts of ideas and passions. They can’t seem to grasp the idea behind the tree of life, even though Darwin’s Origin of Species told all about it and had been around for a long time. It’s hard for me to watch videos like this. I’m closing it down. I just can’t believe someone can say things which are so incredibly evil, and against the interests of the people, and everyone on the planet, yet every word is resounded in cheers and applause. Watching it fills my entire person with an intense sadness and gloom. Hitler speaks to base instincts. He speaks to tribal emotions. He appeals to rituals and makes everything into a sort of religion. He appeals to the reptile brain. He brings out the worst in humanity with his words. He cries out the everyone’s evolutionary baggage, and a switch flips on in the people. Conflict and mayhem are then unleashed onto the world. I really try to keep myself away from that sort of thing as much as possible. I’ve always dreamed of building a cabin out in the middle of nowhere, and having a sailing boat. If I marry one day, I could give up the cabin and live in the city or a suburb, but if that never happens, the cabin is best for me. The cabin is my home base, whereas the sailing ship is my mobile base. I’d sail all around the world, and visit a lot of remote locations like David Attenborough did. I’d dive into the oceans and view the life down there. I’d visit scientists all around the world, and maybe spend a few years here, a few years there, contributing to their research and volunteering to work with them. I priced out that I’d need around 20 million dollars to live that lifestyle. A lot of it is to live on for the duration of my life, living rather modestly, not “paying myself” much more than what you’d make on a normal job. The cabin, with the large amount of land around it, would cost like 5 or 6 million. The sailing ship also costs millions. I’d also need fuel for the ship, and other expenses related to it. Unfortunately it’s not easy to come into that kind of money without spending a lot of time doing business and pursuing it. Also, when you do end up making money you have to fight off the government’s mass printing of money, constantly devaluing the currency. It makes it almost impossible to save up the kind of money you need to do something like that, even if you can make a lot. By the time you make some new money, your old savings has been devalued by half due to the Fed’s monetary policies. In an ideal world I’d also construct myself a science lab. But that’d cost even more. I could give up the sail boat I guess, and maybe rent one, or sail with someone else, but in an ideal world I’d have it all 🙂 I’d like to live on the boat as I traveled to different countries and their ports. I’d keep all my books and research material there with me. I wouldn’t have to lug it around. I also never would have to worry about being robbed. Who would want my mathematics books, or my physics texts? Though I will admit not all my desires revolve around such noble scientific pursuits. I wouldn’t mind owning a large collection of Harley Davidson motorcycles. Haha. The rumbling engine. The open road. Ride through the barren desert on an isolated highway and floor it on the straightaway. Cruise the strip in Vegas late at night. Ride along the beach and eat some crab legs. A man has to have a dream, hasn’t he? That’s mine. But yeah. These days I’ve been busy learning new things and reconnecting to the universe. Somehow I’d been unplugged. I don’t know how or why that happened, but I’ve slowly been re-soldering myself back to the universe’s mainboard. It’s so deep. They’re both humble, yet pillars of intelligence. They know so much, yet their knowledge leads them to exclaim how they know so little. And they do so with great joy! They don’t live in a box! Their minds have opened up to a bigger world. They have come to learn how little they do know, and reach and see just how much they can discover about this universe. They’ve immersed themselves in infinity and eternity. In this last video, I love it when Sagan talks about the brain and how it processes information. He shows an excerpt from Principia Mathematica. The logic the brain uses to compute numbers, and analyze the structure and consistency of the world. Well, I can’t say whether the brain really uses the same operations, but it goes into a lot of details into how a logical mind could do such operations. I’ve read a lot of that book. Well, it’s 3 volumes! 🙂 It gets to where it’s mostly just symbols, each one standing for various logic operations. You get to where you can read it if you spend enough time with it. Speaking of the brain, lately I found a set of lectures on neuroscience, which I’ve been watching lately. Study Physics by day, then when I get tired of that, study history, economics, and neuroscience. And I’ve been studying a little psychology, but not a whole lot. The other day I mentioned how I wanted to share with you the basic properties of light and how it makes its way across the room. I find this absolutely fascinating. We’ll all soon see that light does not behave how you think it does! At least not how I thought it did! I want to talk about the weirdness which takes place when you look at yourself in the mirror, or put on a pair of glasses, or even what it means to see something off in the distance. It’s so weird, and I can’t do it justice when I attempt to describe it in emotional terms. I’m simply going to explain it to you, and let you decide what to think of it. It’s just … just… unbelievable. Light is completely mysterious and you have to study quantum mechanics to understand it. Quantum electrodynamics (QED) patterns the interaction of light and matter, and what I’ll be discussing with you will be a very basic presentation of QED. Though it will be basic, easy to understand, and free from all the complex mathematics, that does not mean it will not be accurate. I hope to help you all understand the core principles behind it all. That’s what I’m going for with this. So how does it all work? Basically, we’re going to draw some spinning arrows, add them up, and then compute these weird probabilities based on them. If you can add and multiply then you’ll be able to follow this discussion, no problems. Now when I present these “arrow rules” to you, you’re going to be sitting back in your chair wondering, “Jason, what does this have to do with light?” Just bear with me. It’ll seem weird, trivial and pointless at first. But these simple rules I’m going to show you will provide a weird sort of framework which can be used to describe literally every dynamic of light! Next I’m going to take that simple rule set we develop and apply it to various everyday scenarios such light traveling across the room, bouncing off a mirror, focusing and bending through a lense, and then conclude with the famous (or infamous!) double slit experiment. Throughout all these experiments we’ll be discussing we’ll only be considering monochromatic red light, but that’s only to make things easier to understand. Ok, here we go. First off assume that light consists of little tiny “bullets” flying around the room, like tiny BBs from a BB gun. We all had BB guns when we were little didn’t we? Well, I grew up in rural Missouri in the United States, and spent most of my time outdoors, fishing and shooting my BB gun at everything that moved! My childhood was like that of Ralphie in the movie A Christmas Carol. I too, as a young boy, received a Red Ryder carbine-action 200-shot range model air rifle for Christmas! It was a real beauty. Unfortunately, many years ago I left it outside in the grass, it got rained on, then rusted. Kids will be kids! Now when I would fire my Red Ryder, the BB flew out in a nice patterned trajectory. Due to the force at which it was propelled, air resistance and gravity, the fired BBs followed a predictable trajectory, which tended to go in a straight line for a short ways then began to slow down and fall toward the ground. Sometimes I had to compensate for this by aiming above my target, and so forth. Let’s take my Red Ryder, and put a light bulb at the end. When I pull the trigger the bulb lights up. Let’s say this bulb emits the monochromatic red light I mentioned just a second ago. Now there’s a special property to these photons. Once they’re emitted by the bulb, we have no idea what they do afterward. Unlike BBs, they don’t have to follow any particular set path or trajectory. 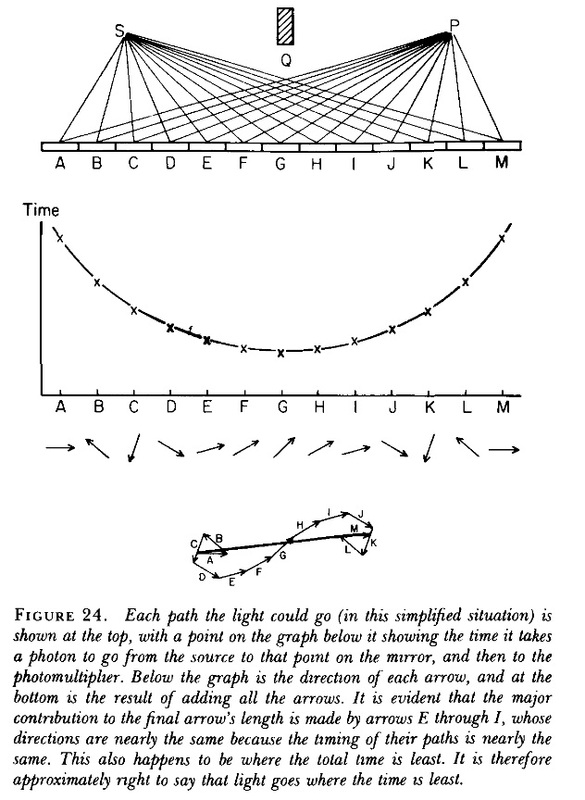 It’s actually impossible to model the trajectory of a photon. What you do instead is take the position of the source (our bulb), and then place a photon detector at some location away from the source, and then using some basic rules you compute the probability that the photon will make it to the detector. What you do is take every possible path the photon could take and represent each path by an arrow. The more paths we have the shorter the arrows are. If there’s 1000 possible paths, each arrow has a length of 1/1000. If there’s 500 possible paths, each arrow has a length of 1/500. What I mean by a “possible path” will be more clear when we get to the examples. Next we give each arrow a direction. Each one of these arrows spins around in a circle, exactly like the hand of a clock does. Basically what you do is imagine the photon traveling from the source to the detector along each alternate path all while having this “arrow” traveling along with it, spinning around in a circle. For our monochromatic red light source our arrow would spin in a circle about 30,000 times in every inch. So it’s pretty quick! After that we add up all the arrows. If there’s a 1000 paths we add up all 1000 arrows. If the arrows are in opposite directions, they cancel one another out. If they’re in the same or similar direction, they add to another. For example, if you had 1000 arrows all in the same direction, then their sum would be 1. If you had 500 arrows pointing toward 9 o’clock (to the left), and 500 arrows pointing toward 3 o’clock (to the right), then the sum would be zero. Now finally we have the last step which is to compute the probability. All you do is take this sum, and then square it. That gives you the probability that a photon emitted from that source location will arrive at the detector. For example, if all of your arrows sum to 0.5, then the probability would be 0.5 x 0.5, which is .25, or 25%. If this is very weird to you, don’t worry. Quantum physics is REALLY WEIRD. Why such a weird rule can pattern all dynamics of light, beats me. But it works, and it’s pretty amazing. So let’s get to some examples. That’s when she thinks to herself, “What’s this guy on?” Then she politely says, “Pardon me”, slips to the bathroom and shortly after bails for the exit, never to return. When she takes her coat and purse with her to the restroom, that’s when you know you’ve screwed up again. You’ve been caught thinking about quantum physics in public! After reading this article, you’ll have to learn to shut these thoughts off while in public, for people do not understand the thoughts of a quantum physicist. Your soft, “Yepppp”, along with your confused expression, was all in hopes to communicate your sense of helplessness to your date. You’re confused. You don’t get what light is. What it does. How it works. What it is that your eyes see. But she didn’t quite get the message and you’ve lost your ability to communicate. Too many hours crunching math equations, and not enough time socializing. Don’t worry, we’ve all been there. Light generally seems to move in straight lines. If I leave the table and stand inbetween where my date once was and the TV, I can imagine that I’d be blocking the TV’s picture for her. The light emitting from the TV rarely bends around me, ignoring my body like some sort of transparent nothing. I block the light. It’s everyday experiences like these which give us the idea that light moves in straight lines. But does it really? *shrugs* In times like these we need to experiment. What to do, what to do. Hmmm, I know! Naturally I’m quite frustrated that my date left me, so I chase her out to the parking lot car, open up my trunk, grab my rusted Red Ryder with the light bulb at the end, with the awesome battery side pack I built myself *big grin*, aim at her and fire! She sees the end of the barrel light up red, and that’s that. I blasted her with some red photons. That’s all I needed to do. The night is done. I then put away my Red Ryder, hop in my car and drive off. As I drive away, exhilarated at how I “showed her”, I begin to wonder if she understood what happened. She probably thinks the light photon traveled straight from the bulb, across the parking lot, and right to her eyes. If she only knew! 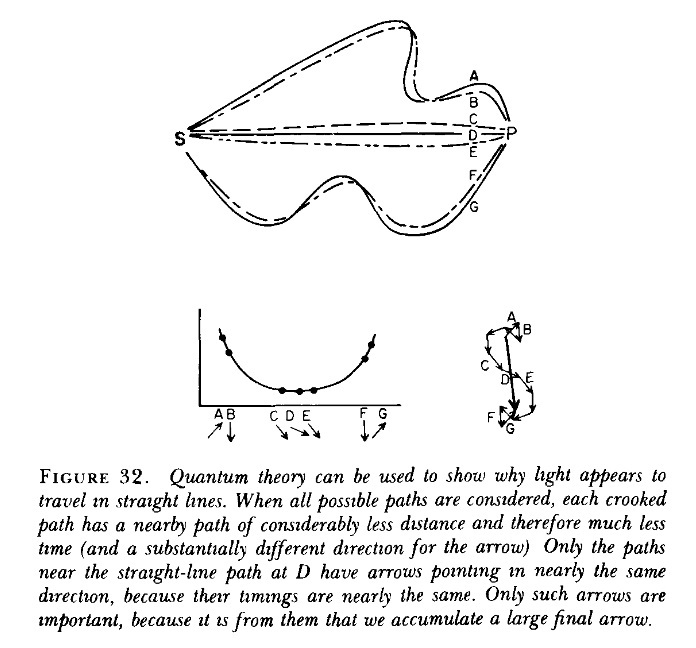 Let’s look at an illustration, taken from Richard Feynman’s book on QED. The light photons I blasted her with could’ve taken any of these possible paths. Basically you can see each path, A,B,C,D,E,F, and G. The bottom left chart plots time, and each time (based on the distance) gives us the direction of the arrow. Remember, the arrow turns in a complete circle approximately 30,000 times per inch. So in this case, the distance determines the arrow direction. At the bottom right you can see that he (Feynman) sums all the arrows together. Some arrows cancel out the others. For example, you can see that A points mostly up, and B almost straight down. They pretty much cancel one another out. Same with F and G. Though you can see that C, D, and E all point in the same direction, therefore add up together. 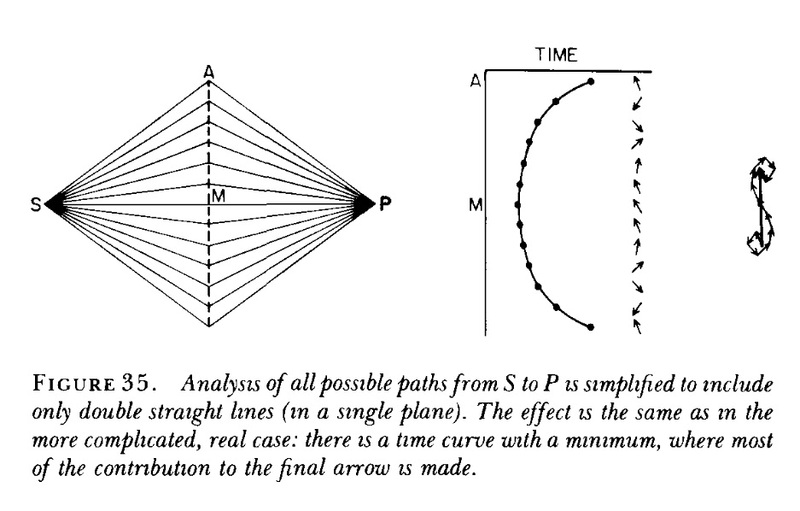 In other words, the “straight line” paths, or those very close to straight, tend to add together the most, while other paths cancel themselves out. 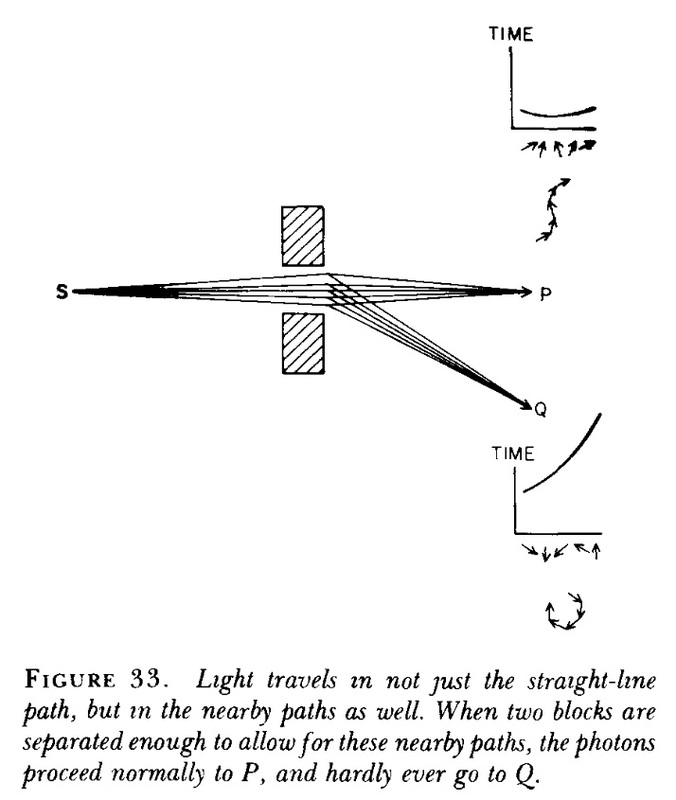 This is what is meant when you say, “Light travels in a straight line.” Does that mean it necessarily does? No. But if you cancel out those straight line paths the probability that the photon makes it to the source goes down to almost nothing. Say my date’s father was secretly hiding in the restaurant, overly protective of his daughter. He sees me pulling out my Red Ryder. He immediately runs toward me, putting himself between me and his daughter. Quite noble of him really. I pull the trigger, the red bulb lights up, but my date doesn’t see anything. Her father’s in the way. Dang it. Experiment foiled. No matter. Even with her annoying father, we still learned something, didn’t we? In general, though it’s not highly probable, some photons, from time to time, may well bend around her father and make it to her eyes. Problem is, since it’s highly improbable, not many photons will do so. And even if one or two do make it to her once in a blue moon, her eyes aren’t sensitive enough to pick up just a photon or two. The human eye needs at least 5 or 6 light photons before it’s stimulated enough to produce a sight sensation. Just on a side note, I used to wonder about Maxwell’s equations. I couldn’t figure out how two electromagnetic waves could travel side by side. How close could they get before they merged together and started to interact with one another? If I shot two waves side by side, super close together, would they ever come together? After all, they’re energy, so they have mass, so wouldn’t gravity pull the two of them together? Really Maxwell’s equations, and electromagnetic fields are approximations. This QED stuff is more precise. It sounds like an awful lot of work to compute all these arrows, calculate their directions and sums, and compute this probability, all for the common sense result that light moves in a straight line, which is what we all thought anyways. I’m with ya. I hate tedious, pointless calculations as much as any other man. But patience my young quantum Padawans. We’ll never be able to build our giant laser and take over the world with that attitude. We’ve only just begun! Mwahaha. Mwhahaha. Mwwwhahahahahaaahahahahaa. We’re all familiar with mirrors, but do we understand how they work? Well, in general most of us believe what we’re told in high school. Our teachers told us that when light bounces off a mirror the angle of incidence equals the angle of reflection. It’d be pretty strange if this wasn’t the case. Imagine facing a mirror directly yet seeing the side of your face, or the top of your head! It’s amazing how many light photons are bouncing off that thing. Photons from every possible view angle are bouncing off that mirror. It’s absolutely incredible. You move your head just a little to the right, or the left, or move a little toward it, or away from it, and the image changes. No big deal, right? You do it everyday. But if you take some time to think about it, that’s really amazing. A mirror doesn’t really reflect just one image. There really is no absolute image in the mirror. There’s an infinite number of images in that mirror. You only see one though, because of where you’re standing and where your eyes are positioned relative to the mirror. 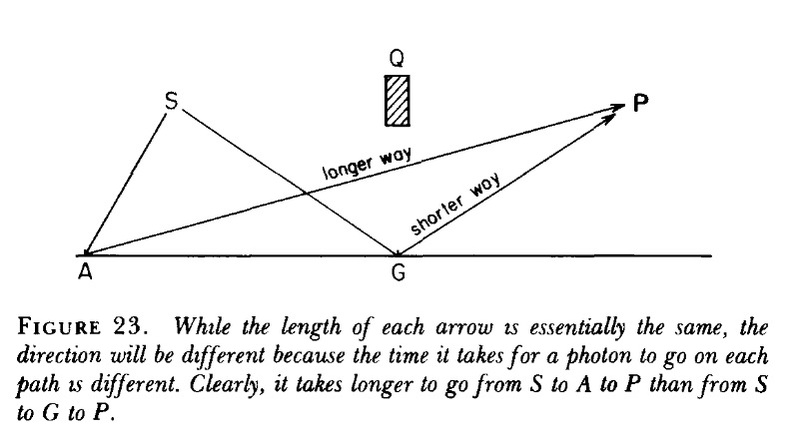 Well, can we use these “arrow rules”, and this QED stuff, to show why light bounces off of a mirror the way it does? You bet we can! Why else would I be writing this? 🙂 Let’s first examine what’s called Fermat’s principle, which says that light always takes the path requiring the least time. It’s very easily illustrated in a picture. Basically, using mathematics, you can take every point from the light source to the mirror, and then to the destination point P, and show that the point where the angle of incidence is equal to the angle of reflection is always the shortest path. Remember those optimization problems in Calculus class? 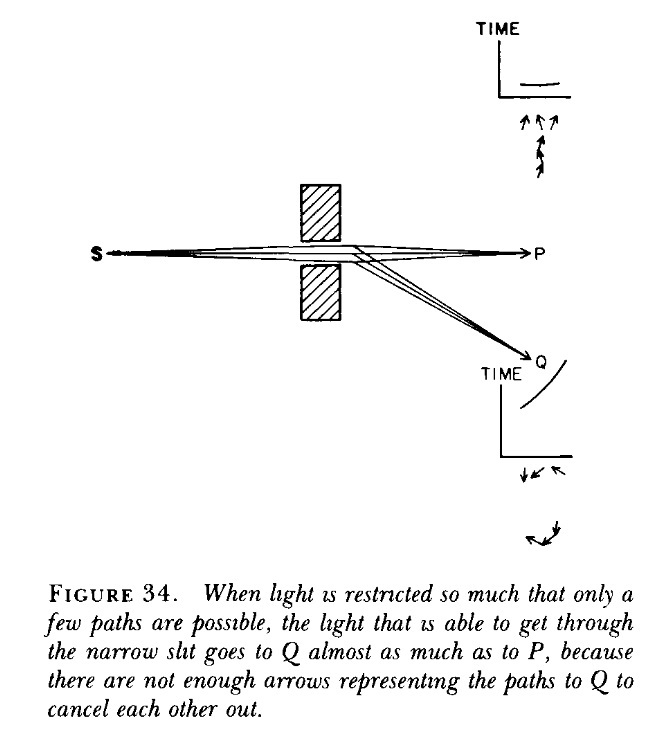 A lot of undergraduate physics textbooks talk about Fermat’s principle, and work out the mathematics proving this “shortest path,” proof for light. I always found it confusing. I understood the math, but I didn’t believe that was the real picture. It was like light looked at the mirror, scanned every possible path, and then “choose” the shortest route. Every photon had a sort of free will of its own, and was incredibly lazy, always taking the easiest way out. They were smart little calculating machines, always deliberating what to do, and making sure to do so with maximum efficiency. So using our “arrow” technique, lets represent light bouncing off the mirror along every possible path, and sum up the arrows. What do we get? So if you sum up all the paths, you see that the middle portions of the mirror contribute the most to the probability calculation, with their arrows adding up. The other arrows cancel one another out. You can see that F,G,H, and I all point in relatively the same direction, so they add together. So saying the angle of incidence is equal to the angle of reflection, and that light takes the shortest path is pretty close to correct. Not always though. 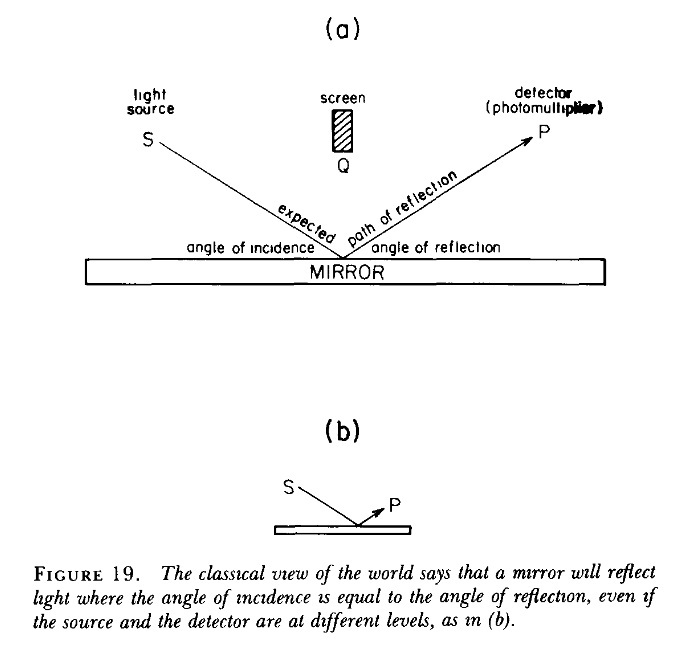 So if I stood in front of this mirror, blocking F, G, H, and I, but leaving the rest of the mirror uncovered, the probability that a photon emitted from the source at S will make it to the detector at P goes way down. It’s not impossible. Light may well take a weird path and make it there, but it’s improbable. Imagine me standing beside you, yet you look in the mirror and it ignores that I’m even there. All the photons just travel around me and ignore my presence. Remember though, that’s possible, just not very probable. Maybe understanding quantum physics well enough, you could engineer a device which makes you invisible in mirrors by changing various energy fields around you. I don’t know. Plato’s Ring of Gyges made a reality! Once again, you may be wondering why go through with these elaborate procedures of “all possible paths,” and all these arrows, when it doesn’t allow us to predict anything new. What’s the point? Well, be prepared to be amazed. I’m about to make your beloved mirror do some weird things. What if I carefully scrape away parts of the mirror that that are canceling out my arrows, but leave others which are pointing in the certain direction I want? Interesting things begin to happen! What sort of mirror do I end up with? I end up with a mirror that reflects light at weird angles! But, I soon run into problems. So far we’ve only been considering a particular shade of red light. That’s where the 30,000 cycles per inch comes from. But when I change the frequency of the light, say to blue, or violet, or something else, that messes with my arrow directions. 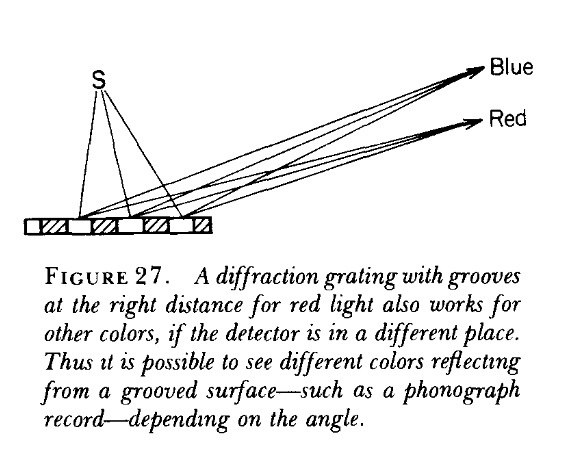 In other words different colors of light begin to respond differently based on what areas of the mirror I scratch off. Actually, mirrors like this exist, and they’re called “diffraction gratings.” Pretty neat things really. Basically engineers use fine precision machinery and make mirrors with microscopic sections etched off, all evenly spaced. The net effect is that each color starts to reflect off of it at different angle. You may have heard of spectral analysis? It’s used in astronomy, astrophysics, physics, and other things. They use diffraction gratings. We’ve played with mirrors long enough. Light bending through a lense can also be explained using these same techniques. Say we want to focus light using a lense. To do this we need only one new bit of information: if the material is transparent, light moves at different speeds through different materials. This modifies the cycles per inch number when computing our arrow directions. In a lense we exploit this fact, and trick nature into putting the light where we want it. Let’s look at a set of paths without a lense. The “outer” paths are longer than the more direct paths, and this throws off all the arrows. They cancel one another out. But what if we inserted a piece of glass, knowing that light moves slower through glass than through the air or empty space? What would happen? If the glass was thicker toward the middle and thin toward the top, that would slow down the middle paths (around M), and if we’re clever, we can shape the glass just so to where each path to our destination P takes the same amount of time, and therefore all arrows add together. 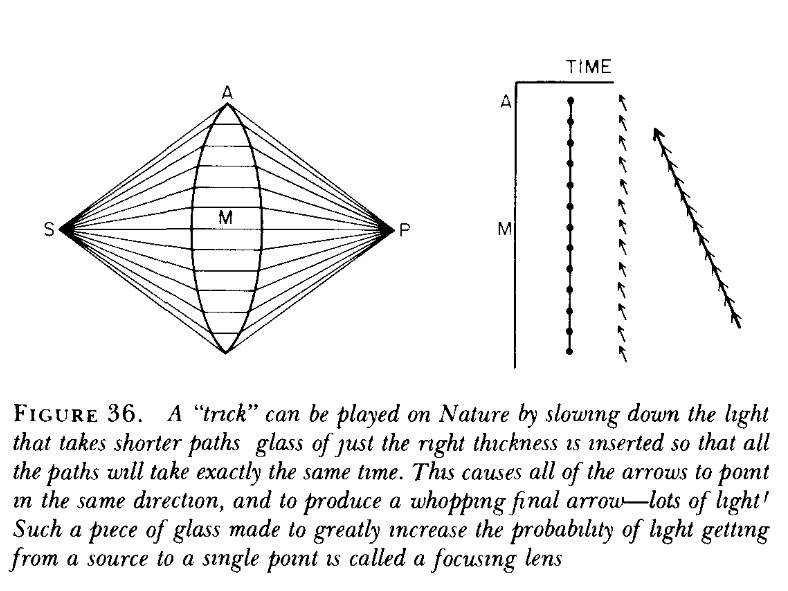 Near every photon emitted would be “focused” and end up at that location. That’s really the quantum mechanical interpretation of light through a lense, though we didn’t get into the atomic details, such as each atom’s electrons, which quantum mechanics also deals with. Really the light doesn’t “pass through” the lense. The energy of the photons is absorbed by the glass atoms, and is then re-radiated. The time it takes for the atoms to absorb the photons, then emit new ones, and so on and so forth, each atom “passing on” the photon, one to another, is what slows down the “speed of light” through the material. But how come we can see through a piece of glass, but not a brick wall? Some materials just absorb the photons, which causes random vibrations in the atoms, and instead of passing through, a new photon of a different magnitude is fired back. In a brick wall, the sunlight both heats up the surface, and also reflects back the red light which allows us to see the wall during the daytime. Or take a black leather car seat in the middle of the summer. The seats are hot as fire when you get in. This is because light made it through the windows and then made its way toward your seats. Your seat material absorbed the light photons and this caused the atoms to vibrate, which is what heat is. This also gave off radiation, which then heated up the air within your car as well. But other materials, such as glass, only temporarily absorb the photons, but then re-radiate them, passing the photon to the atom next to it until it finally exits out the backside of the material. Depending on how the material absorbs the light photons, and re-radiates them determines how fast the speed of light is through the material, and also how thick the lense has to be to have the proper effects. You oftentimes see old people wearing big thick glasses. Depending on how much the material can slow down the speed of light, and what’s wrong with their eyesight, will determine how thick the lense needs to be. This little arrow technique is pretty amazing isn’t it? You just take up all the different paths, represent them with these spinning arrows, then add them all up, and square the resulting magnitude’s sum. Hard to believe that it works. One puzzling thing about light is how it spreads itself out in a wave when making its way through a tight slit. Or how if you put two slits close together and push light through them you get these interference effects. You start to ask yourself whether light is a wave, or is it a particle? There’s talk about wave-particle duality, and you learn about things like “diffraction” and “interference.” Well, all of these things can be explained by these same simple rules. 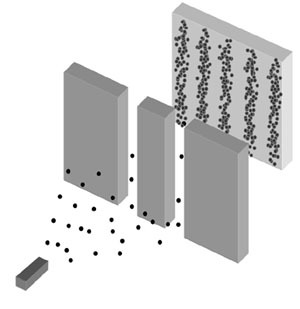 You can see from this illustration above how light moves in these particles, but it sort of acts like a wave at the same time. You get those interference bands. Let’s represent this scenario with our paths and arrows. We’ll just explain it for a single slit, but by now you guys shouldn’t have a problem seeing how it would work with double slits. It’s the exact same principle. First let’s examine the behavior of light moving through an opening. Assume the “slit” is fairly wide and is not a tight squeeze. In this case light proceeds pretty much straight through, not really spreading out at all. But once we push light through a tight squeeze it starts to behave differently. Pretty cool huh? By now I think you guys should understand the basics of light. I hope you enjoyed this.